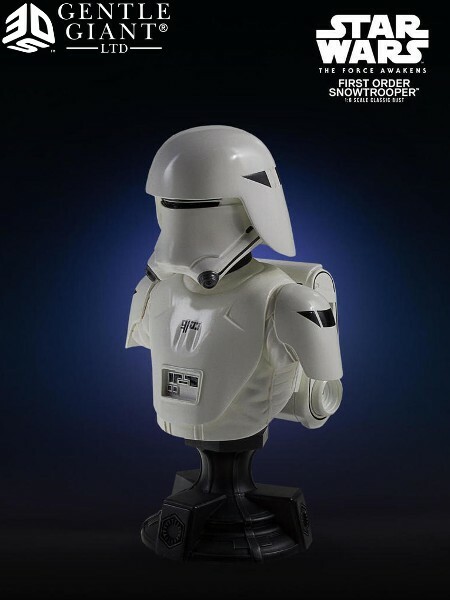 Gentle Giant Star Wars First Order Snowtrooper Classic Bust. First Order Snowtroopers assigned to frigid planets such as Starkiller Base wear specialized armor and gear that let them operate effectively in icy conditions. 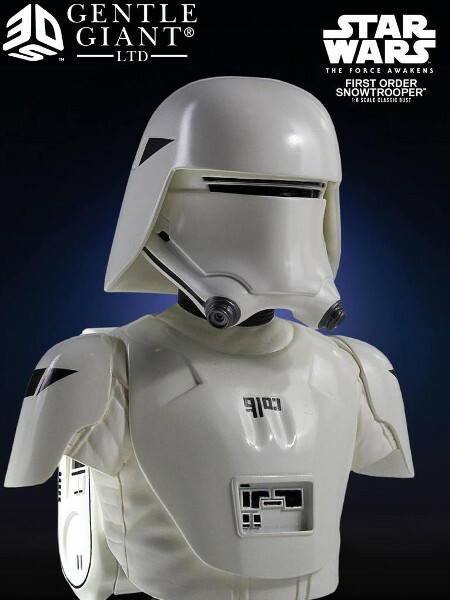 Snowtroopers carry a backpack-style personal environment unit and wear insulated helmets with glare-reducing slit lenses, gloves, a kama, and a heat-resistant body glove beneath an oversuit of wind-resistant fabric. Snowtrooper teams scouted the planet that now houses Starkiller Base, eliminating native life forms that posed a potential threat. The Gentle Giant Ltd. 1:6 scale First Order Snowtrooper Classic Bust combines the timeless aesthetics of sculpture from Greek and Roman antiquity, with characters from the ongoing Star Wars saga. Each limited edition hand-painted polyresin classic bust comes individually numbered and is paired with a matching certificate of authenticity. This Mini Bust is a Limited Edition Size of 4000 Pieces Produced Worldwide.